Learn to make Homemade Mango Ice Cream Recipe (No Ice Cream Maker Machine) with the easy step-by-step video tutorial. 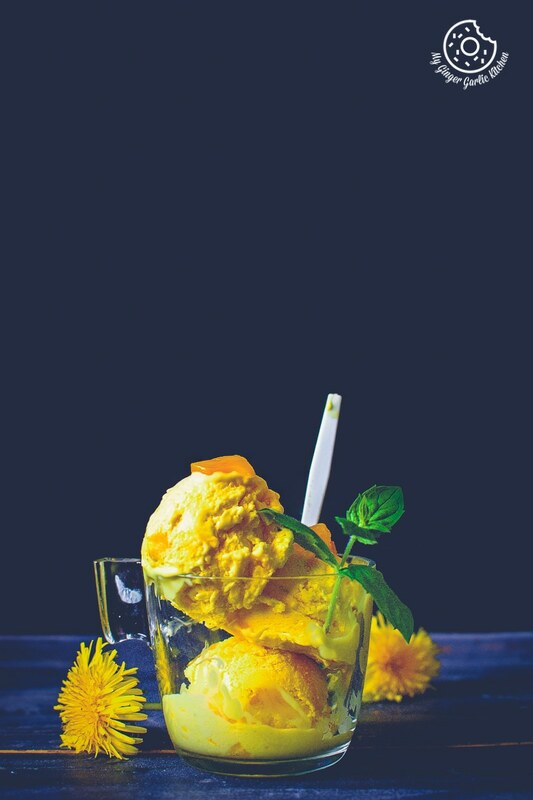 Can you believe this creamiest and dreamiest tropical mango ice cream is made without an ice cream maker? It’s true. This summer blockbuster recipe makes a super creamy and classic ice cream full of original fresh mango flavors. This easy no-churn recipe is super easy to do at home. Another good thing about this homemade ice cream is the fact that it is made with real mangoes. Because with the store-bought artificial flavors and essences, you are never so sure about their authenticity. Similar to all my other ice cream recipes, this ice cream is also made from scratch. As I already told you that this no-churn ice cream also doesn’t require any ice cream maker or machine. Mango is India’s national fruit. Know why? Summer and mangoes have a great connection for many Indians. So much so that Mango is India’s national fruit. Yeah, really. I have yet to meet someone who doesn’t like Indian mangoes. Anyone who has spent their childhood in India could relate to me. Summer holidays bring the abundance of so many varieties of delicious ‘Aam, aka Mangoes’. There are many types of mangoes. Some of the big names are: Alphonso, Safeda, Badami, Chausa, Dasheri, Kesar, Langra, Mulgoba, Neelam, Raspuri, Himsagar, Totapuri, Benishan, Rajapuri, Amrapali and many more. Those days were so precious when Mom and Granny used to make so many yummy dishes using ripe mangoes and raw mangoes. Some of those dishes were meant for consuming instantly, such as mango kulfi, mango phirni, mango shrikhand, mango lassi, mango halwa, aam panna, and many more. Furthemore, some of them were the long-lasting dishes which we used throughout the year. They included aam ka achaar aka mango pickle, aam ka murabba aka mango jam, aam ki chutney and then some more. If you are a regular reader of my blog then you must be wondering why I haven’t shared all of these mentioned mango recipes on my blog yet. The reason is pretty simple and basic. Here’s the reason: I don’t visit India during summer time and we usually don’t get good mangoes in the Nordics. But I can tell you that I badly miss the variety of Indian mangoes I used to cherish during my early years. Every time I see mangoes I jump at them like a ‘hungry lioness’. 😉 How funny is that? Some tiny things give you the joy of life which many times don’t come even with the biggest luxuries of the material world. Well, mysteries of the human brain. Luckily, last weekend I saw some excellent quality mangoes. Unsurprisingly, I clutched them. We ate a couple of them and with some, I made this mango ice cream. 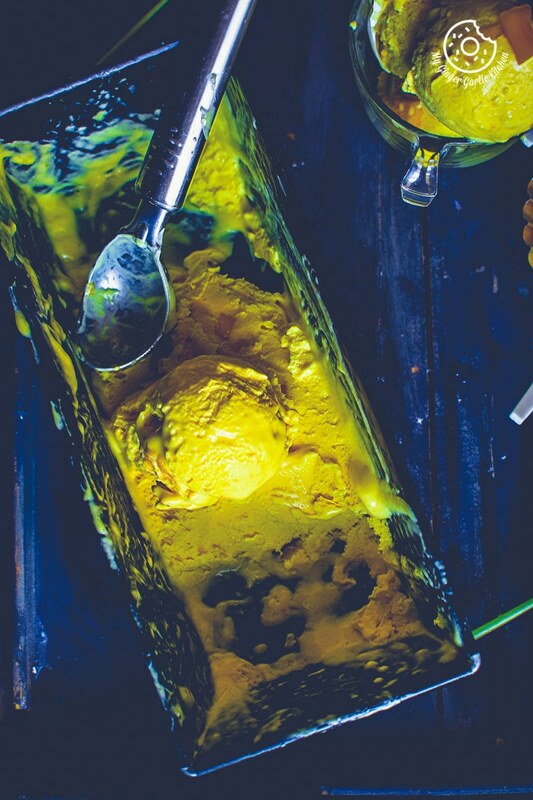 Because mango ice cream is the perfect frozen treat for summer anywhere. This rich and luscious ice cream definitely makes the perfect extraordinary feast for cooling down on a hot summer day. 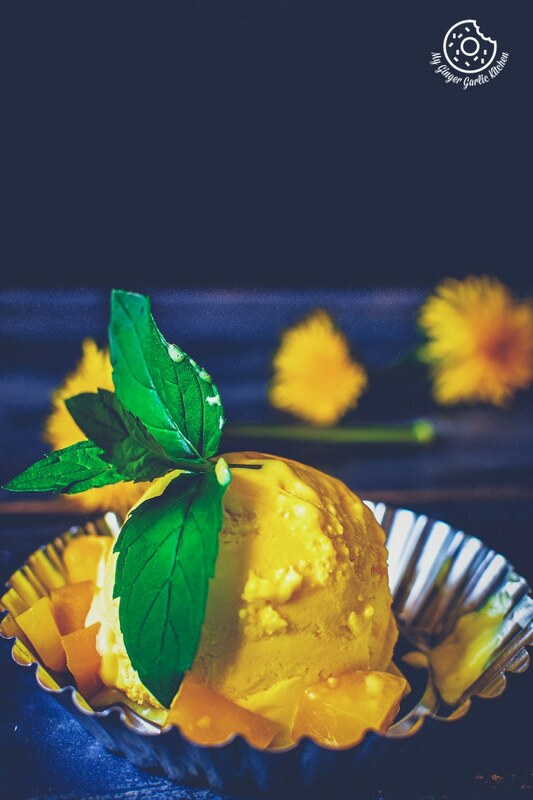 This homemade Mango Ice Cream recipe is for all of you who love mangoes like I do, and also for those who love mango ice cream. 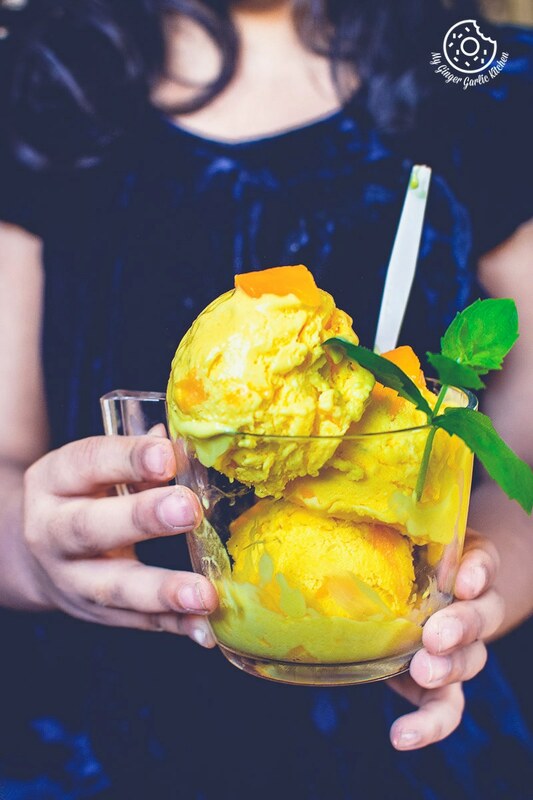 Mango lovers, this mango ice cream is a mango dream come true. 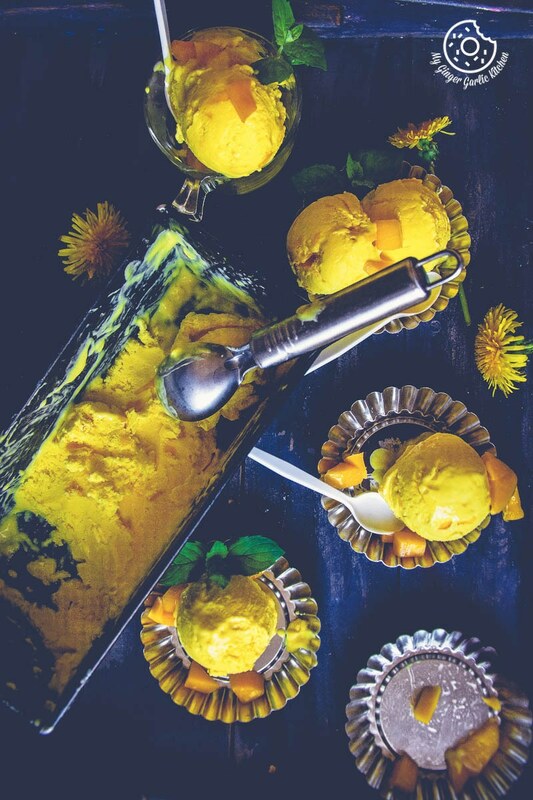 Why is homemade mango ice cream the best? If you are still unconvinced that homemade is the way to go, well, here’s the clincher. This mango ice cream has the real taste of mango. Moreover, this astonishingly delicious mango ice cream does not have any synthetic additives. I have just added a few drops of vanilla essence which enhances the mango flavor but that is completely optional. So 100% authentic, so full of love. The texture of this vibrant ice cream is really, rich and creamy. You just have to freeze it for 2 hours first, and then stir the ice cream. This stirring would make sure that you don’t get even the tiny bit of ice crystals. Then again freeze for 6-8 hours. And leave it on the counter for a few minutes and this ice cream softens and is really scoopable without melting. With chopped mangoes, with pureed mangoes, or with the combination of chopped pureed mangoes. With cooked pureed mangoes and uncooked mangoes. Only with milk, only with whipping cream, or the combination of both. With condensed milk and without condensed milk. This is my version of the mango ice cream which I have opted-for after many trials. It is completely no churn and is totally made without using an ice cream maker. It has no eggs, no cornstarch. It has sweetened condensed milk, a combination of pureed mangoes and chopped mangoes. 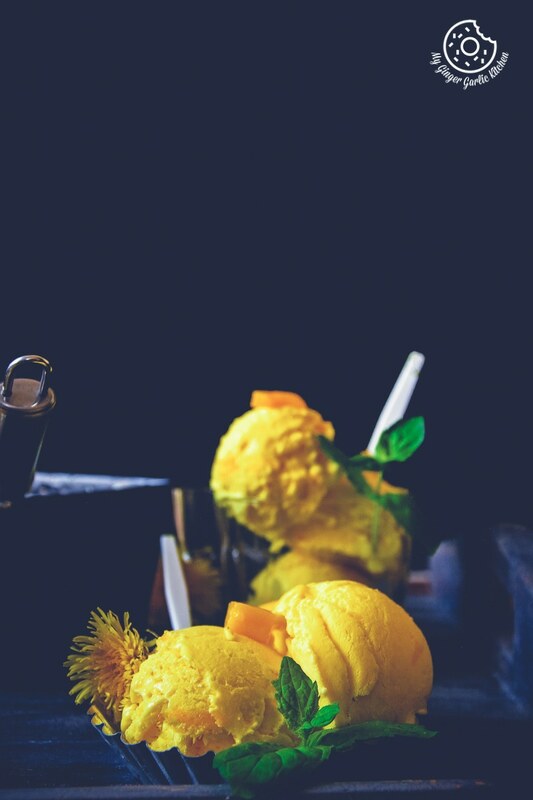 With my version, you will get the creamy dreamy, smooth and flavourful mango ice cream for sure. 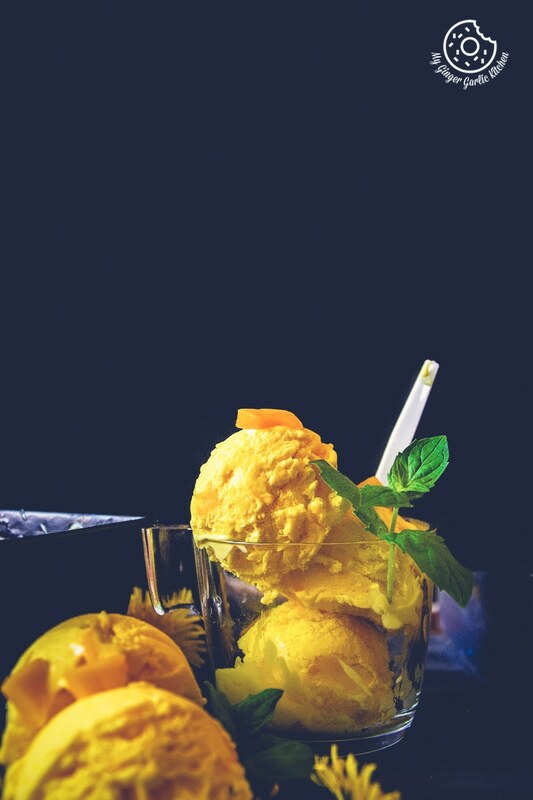 I can assure you, homemade mango ice cream can’t get any better. You can also make coconut mango ice cream with this recipe. 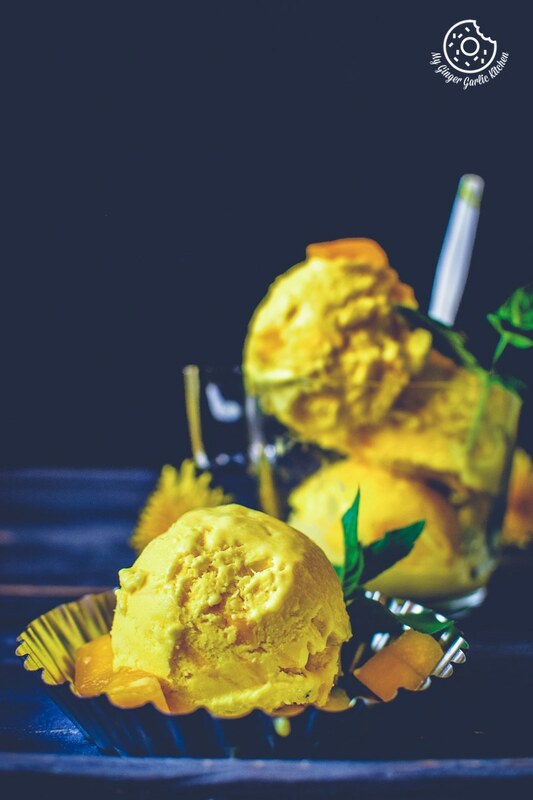 For making mango coconut ice cream you can simply replace whipping cream with coconut cream, condensed milk with coconut condensed milk, and milk with coconut milk. 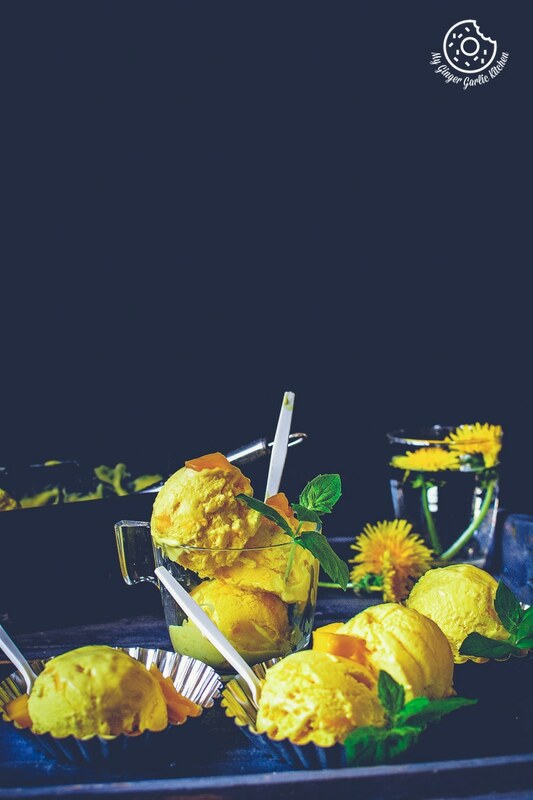 For making this rich and scoopable frozen summer treat, you’ll only need some good quality mangoes, condensed milk, chilled whipping cream, and chilled milk. 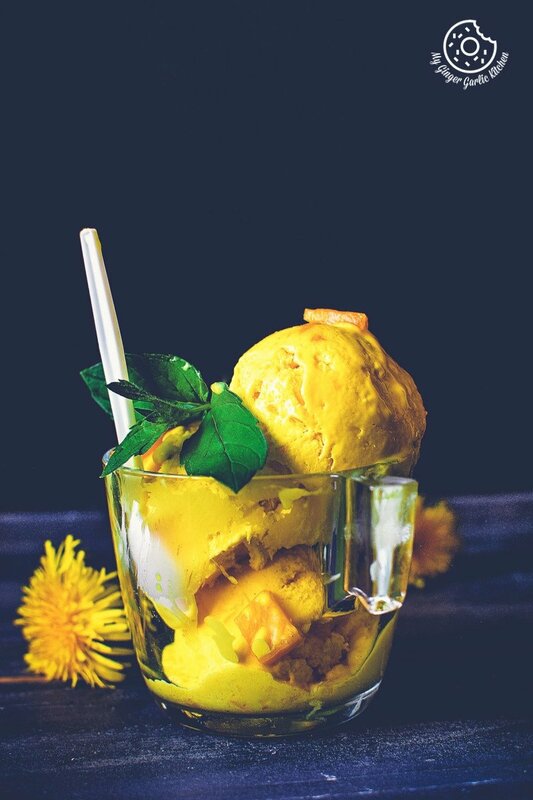 This delightful mango ice cream recipe is made using mango puree and cream. And of course, this can be made without an ice cream maker. How enchanting is that? 1. Wash, peel and chop mango to pieces. 2. Add them to a blender jar and blend to make a smooth puree. Set it aside. 1. Refrigerate a mixing bowl for 1 hour. 2. Add 1 cup chilled whipping cream to the refrigerated mixing bowl. 3. Beat the cream on high until it forms stiff peaks. 4. Add the 1/2 cup of sweetened condensed milk, vanilla extract, mango puree and 4 tsp chopped mangoes. 6. Cover with the cling film. 7. Freeze for 2 hours. 8. Unwrap and stir well to combine. 9. Pour into a freezer safe container. 10. Cover with cling film and freeze for 6-8 hours or overnight. 11. Scoop out mango ice-cream in a cup or cone. 12. Garnish with chopped mangoes, and mint leaves.